The holidays at Walt Disney Concert Hall are here. From December 16 to New Years Eve, the LA Phil is presenting something for the whole family including Sing Alongs, Jazz and fun NYE themed events. This truly is the perfect Holiday outing for the entire family. Holiday Sing-Along with two performances on Dec. 16 at Walt Disney Concert Hall. Audience of all ages joins in singing holiday songs accompanied by the Angeles Chorale, a jazz combo and the Hall’s huge pipe organ. Arrive early to warm up your voices and take photos with Santa at a Winter Wonderland party. Complimentary Hot Chocolate & Coffee along with Children Activities. 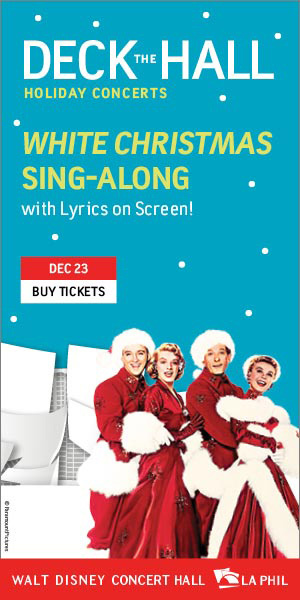 White Christmas Sing-Along on Dec. 23. The audience sings along to the beloved Irving Berlin songs while the 1954 film and lyrics are projected on the big screen. New Year’s Eve with Scott Bradlee’s Postmodern Jukebox. Ring in the New Year with their sophisticated style and infectious twist on modern pop hits in the style of jazz, ragtime, swing and more. There's nothing like celebrating the Holidays at Walt Disney Concert Hall.